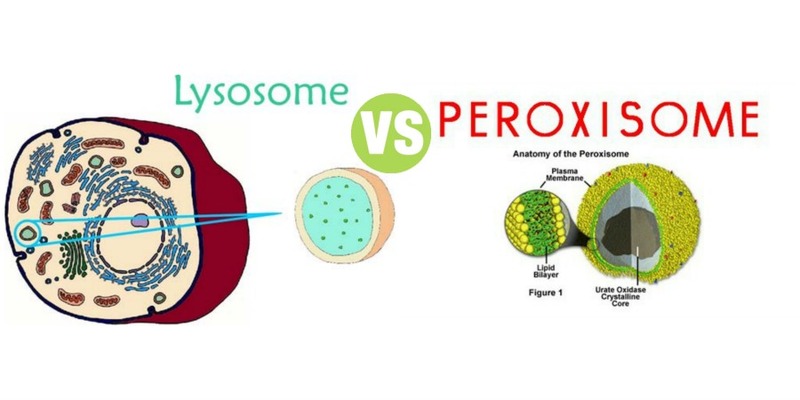 Summary: Difference Between Lysosomes and Peroxisomes is that Lysosomes are the membrane-bound vesicular organelles found throughout the cytoplasm. The lysosomes are formed by Golgi apparatus. The enzymes synthesized in rough endoplasmic reticulum are processed and packed in the form of small vesicles in the Golgi apparatus. Then, these vesicles are pinched off from Golgi apparatus and become the lysosomes. While Peroxisomes or microbodies are the membrane limited vesicles like the lysosomes. Unlike lysosomes, peroxisomes are pinched off from endoplasmic reticulum and not from the Golgi apparatus. Peroxisomes or microbodies are the membrane limited vesicles like the lysosomes. Unlike lysosomes, peroxisomes are pinched off from endoplasmic reticulum and not from the Golgi apparatus. Peroxisomes contain some oxidative enzymes such as catalase, urate oxidase and D­amino acid oxidase.